What if your author website and blog attracted thousands of engaged fans, increased your income to six-figure digits, and gave you the time and independence to focus on your passion - writing? Hustling like crazy with little result - wasted money on Facebook and Google ads because, well, you've just thrown them together and not really sure how they work. Throwing time and money away from your loved ones on posting, sharing, blogging, running ads and flipping through screens and articles on how to grow as an author and blogger. And you're tired of guest posting or trying to figure out where you can guest post next, and tired of posting repeatedly in groups with only marginal success. Your email list is in the hundreds or low thousands, and even that list is really just a list of author friends. What your ideal audience is and where to get those subscribers has always kind of escaped you. The big bloggers and mainstream authors seem to have figured it all out - so why can't you? They have an audience - how did they get there? You're not even sure what your author blog's focus should be on. Are you busy talking about the author market and indie book issues or are you blogging about your own work? Where's your voice and your audience? You've lost motivation. You feel like you have nothing of value to share with the world because everyone else seems to be an expert on just about everything. You're just another voice and an unheard-of author in the mix of things. You detest your day job (quite possibly) and want to be a full-time blogger or writer. Grow your online traffic and social media following like you couldn't imagine in just an hour a week. Constantly draw in new readers and subscribers (not to mention traffic) who are excited to hear what you have to say and are more than willing to share it with their friends and followers. An author's and blogger's dream, right?! Become the online leader in your area of expertise and be known for your writing. Be the go-to person for in-the-know. Have a social media following that you can rely on to engage with you. To buy your books, products, services, etc. Have business growth without spending money on ads. Have book orders and sales on Amazon come in and be able to pinpoint exactly where the traffic is coming from. Have extra hours in your day to create amazing content, engage with your audience and spend time enjoying life away from your blog and author website, knowing it will continue growing even while you aren't working (maybe even sleeping!). Practically everything you do will become automated, and you can sit back, smile and go do other fun things. Turn your author website and blog along with your efforts into your full-time career. You’ve already achieved what most people aren’t willing to do: start your own successful business by leveraging your new audience and potential. So why not take it to the next level and succeed beyond what anyone, including yourself, could have ever imagined? 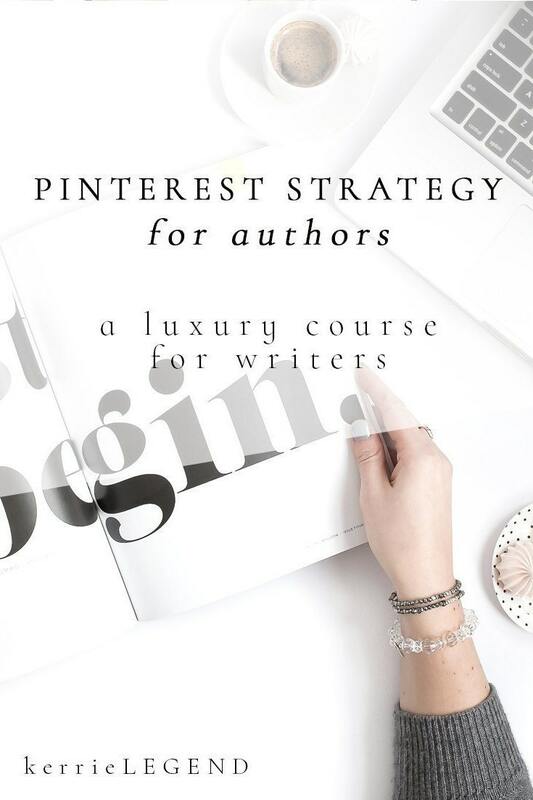 I want to introduce you to my secret stash of information: Pinterest Marketing for Authors, an online course designed just for people such as yourself who struggle with things I mentioned above and want the kind of lifestyle that allows you to pursue your passions in life. Pinterest Marketing for Authors is my step-by-step course and community where I’ll teach you my highly effective Pinterest system using a few tricks, so you can stop being frustrated with your blogging and business growth and start growing your blog and business organically, authentically, and quickly. Most people are using it the wrong way. Pinterest shows users how to pin things they like to store them for later, but as a business owner, you need to use it different than your average consumer. I'm going to show you the best ways to use it and implement it into your author business. And it's not going to cost you hundreds of dollars like other courses. Guess what? You can learn all of this information for just $49. I can teach you this information in just 3 hours. And then you can get started growing immediately. Remember - Pinterest is based on search - so readers search for books like yours using keywords. I'll show you how to set everything up, boost your SEO in the process, and get you moving. Did you know book pins are often shared and repinned thousands of times? !